No one knows your skin better than you. Although we may be able to immediately point out when something is out of place, most of us aren’t sure what these abnormalities may be. More often than not, we will either brush them off as “nothing” or jump to the worst possible conclusion. Rather than playing a guessing game when it comes to your skin’s health, it’s best to know for sure what’s going on. After all, as they say, it’s important to be comfortable in your own skin. If you notice that your skin has taken a strange yellowish tint, you may be suffering from carotenemia. This is a condition where the body has higher than necessary levels of beta-carotene, most commonly due to a large consumption of, you guessed it, carrots. Diets filled with other carotene-rich foods, such as pumpkins and sweet potatoes, can also cause your skin to take on this strange hue. Carotenemia, although alarming to the eye, is harmless. The yellowish hue will subside once you bring your carotene consumption back to a normal level. Yellow skin can also be a sign of jaundice, an extremely serious condition caused by liver problems. Jaundice will also cause an individual’s eyes to turn yellow, something carotenemia does not do. Jaundice occurs when the liver is no longer able to handle the blood cells as they break down. Jaundice is usually found as a side effect of a variety of conditions, such as cirrhosis, blood diseases, and even certain medications. Due to the dangers associated with this condition, it’s important to consult professional help at the first sign of skin yellowing. Skin complexion is determined by the amount of melanin people have in their skin, and those with a naturally fair complexion have less melanin. If you notice a sudden and severe lightening of your complexion this may be caused by a change in blood flow rather than melanin. When a person does not have enough healthy red blood cells to carry adequate oxygen to their tissues, they may develop anemia. Along with a fairer complexion, the condition is also characterized by a persistent feeling of fatigue. The condition is not often serious and can usually be treated by supplements or even a shift in diet. It’s important not to self-diagnose anemia because, although it’s often caused by a simple vitamin deficiency, in more rare cases it can be the result of more serious conditions such as leukemia or sickle cell. Purple blotches on the skin are a fairly common occurrence known as purpura (Latin for “purple”). They are caused when small blood vessels burst and cause the blood to pool under the skin. These purple blotches are somewhat common in adults aged 65 and older and are a sign of years of skin damage and the subsequent weakening of blood vessels. However, the condition may also be a clue to more serious underlying health problems. These bruises could be caused by a variety of conditions, such as blood clotting disorders, vitamin C deficiencies, and blood stream infections. Individuals with the condition should consult with a physician to determine its true cause. Adolescent acne is common and usually caused by the often drastic hormonal changes we go through during puberty. Acne as an adult isn’t quite as normal and, unfortunately, is usually a clue to an underlying health problem. Perhaps the most common health problem associated with adult acne in women is polycystic ovary syndrome, or PCOS. This is an endocrine system disorder found among women of reproductive age and is characterized by enlarged ovaries, which may contain small bunches of fluid, called follicles. Along with adult acne, the condition can cause excessive hair growth, prolonged menstrual periods, and even obesity. PCOS has been identified as a factor in many other conditions, such as type 2 diabetes and infertility. Once again, it’s important to consult with a doctor if you suspect you may have PCOS. Most of the time, sunken eyes surrounded by dark circles are a sign that you aren’t getting enough sleep. However, if these dark circles persist even when you increase your sleep, it may be a sign of a vitamin deficiency. Vitamin C is needed to form collagen, and low levels of this vitamin, a condition called scurvy, can cause the eyelids to appear sunken. Thankfully this condition is easily reversed by orally taking vitamin C supplements. Dehydration can also cause the skin under your eyes to appear sunken. When mild, dehydration is easy to reverse. Drinking an electrolyte-rich beverage such as Gatorade can help. When severe, though, medical attention may be necessary. Nearly everyone will experience dry skin at some point in their lives, and most often this is caused by long hot showers and harsh winter weather. Sometimes, though, dry skin is a symptom of not eating enough good fats. 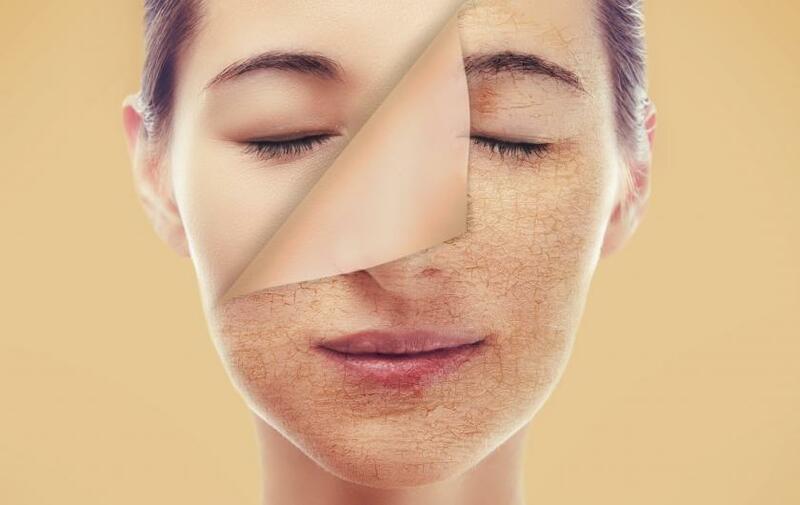 “Skin without enough fat in it has a protein predominance and is kind of like a mess made just of twigs with no glue between them," Dr. Amy Newburger from the dermatology department at St.Luke’s Roosevelt Medical Center told Everyday Heath. Eating more omega-3 fatty acid rich foods, such as salmon, anchovies, and eggs may help to combat dry itchy skin. Dry skin may also be a sign of overconsumption of alcohol. “The average person having a glass of wine with dinner every night and maintaining adequate fluid intake is unlikely to see any real difference," explained Michele Murphy, a registered dietitian at New York Presbyterian–Weill Cornell Medical Center in Everyday Health, emphasizing that an individual’s alcohol intake would have to be quite high to affect the skin in such a way.